Sales taxes are paradoxically transparent and non-transparent. A taxpayer can easily see how high the tax is by looking at the receipt for any purchase. It’s hard to imagine a more transparent tax. However, due to the wide variety of local option sales taxes among municipalities, a taxpayer can be puzzled by the many different tax rates his receipts show in various parts of the state. Making use of newly available data sources, we are now able to update information on average local sales taxes more regularly. Table 1 and the accompanying map show current state sales taxes, average local sales taxes, and the combined rate and state rank. Source: Sales Tax Clearinghouse; Census Bureau; Departments of Revenue. There are five states that do without a general statewide sales tax: Alaska, Delaware, Montana, New Hampshire and Oregon. Alaska is the only state on this list that allows municipalities to charge a local sales tax, and these can be quite high in some cases. For example, Juneau, the capital, has a city sales tax rate of 5 percent. Delaware, Montana, New Hampshire and Oregon rank lowest with no state or local sales taxes. Alaska comes next with a combined local and state rate of 1.61 percent, followed by Hawaii (4.38 percent), Maine (5 percent), Virginia (5 percent), Wisconsin (5.42 percent) and Wyoming (5.42 percent). The states with highest combined state-local rates are Tennessee (9.41 percent), California (9.06 percent), Washington (8.78 percent), Oklahoma (8.44 percent) and Louisiana (8.43 percent). The dubious distinction of having the highest combined sales tax goes to four localities in central Alabama. Brookwood, Coaling, Coker and Vance have a total sales tax of 11 percent. Individuals making purchases in any of these municipalities owe 4 percent to the State of Alabama, 5 percent to Tuscaloosa County, and finally 2 percent to the city. California has the highest statewide rate of 8.25 percent, including a mandatory 1 percent tax collected by the state but distributed to local governments. (Some sources describe California’s statewide sales tax as one percentage point lower for this reason.) Six states tie for the second highest rate of 7 percent: Indiana, North Carolina, Mississippi, New Jersey, Rhode Island, and Tennessee. The lowest non-zero rate goes to Colorado with a rate of 2.90 percent. There are seven states that are next in line with a 4 percent rate: Alabama, Georgia, Hawaii, Louisiana, New York, South Dakota, and Wyoming. As one can see from the table, local rates can make up a large percentage of the overall sales rate. For example, in Colorado the local rate makes up 60 percent of the overall sales tax rate. In Alaska, the local rate is 100 percent of the total sales tax rate. 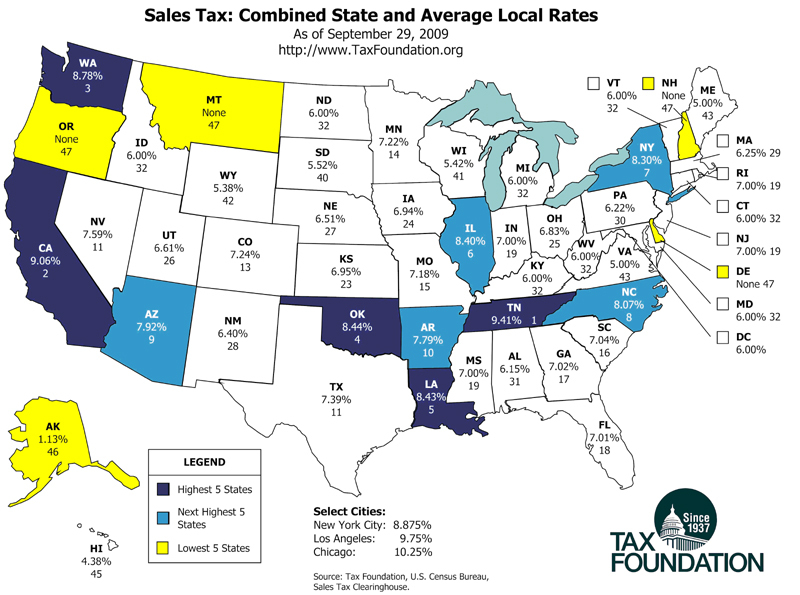 16 states have no local option general sales tax. The states with the highest average local sales tax rates are Louisiana (4.43 percent), Colorado (4.34 percent), New York (4.30 percent), Oklahoma (3.94 percent) and Georgia (3.02 percent). The states with the lowest non-zero local rate are Pennsylvania (0.22 percent), Hawaii (0.34 percent), Minnesota (0.34 percent), Wisconsin (0.42 percent) and Utah (0.66 percent). This report compiles the widely available state sales tax rates from the Facts and Figures Mid-Year Update5 with local sales tax rate data for counties and cities. The city data are reported at the five-digit zip code level. For example, the table below represents two zip codes in Louisiana that correspond to two different cities in Allen Parish: 70658 is Reeves, LA and 70638 is Elizabeth, LA. Louisiana has a state-wide rate of 4 percent and Allen Parish has a local rate of 4.7 percent. Reeves does not charge a city-level sales tax, but Elizabeth does have a rate of 1.3 percent. The total combined state and local rates for Reeves is 8.7 percent and Elizabeth is an even 10 percent. Since the rates are reported by zip code, and localities may contain all or part of many zip code areas, some inexactitude creeps in during the conversion from zip code to locality. There are at least 40,000 five-digit zip code areas overlapping the more than 8,000 localities in the U.S. We average the zip code rates within each locality. An improvement would be to weight those zip codes by volume of sales or personal income or population, but we are unable to do so for this study. Within each state, however, we average the local rates and weight them by personal income as reported by the Bureau of Economic Analysis within the Department of Commerce. 1. Average of all local rates, weighted by personal income. 2. California and Virginia both mandate and collect a 1 percent “local rate” that we list here as part of the state rate because localities do not have the authority to change it. 3. In Utah, the state mandates a 1.25 percent “local” add-on rate. Because localities do not have the authority to amend it, we list it here as part of the state rate. 4. California and Virginia both mandate and collect a 1 percent “local” add-on rate. Because localities do not have the authority to amend it, we list them here as part of the state rate. 6. Louisiana calls its counties parishes.